-First Annual Women’s Demo & Ride, with on-trail scavenger hunt and bbq, held in Remer during their Harvest Festival. -First summer riding the Sheriff Department’s RZRs, helping monitor local trails, and assisting at Moondance Country and Moondance Jam. -First call from Sheriff Burch for our Search & Rescue ATV Team to assist in a search for a missing person in Cass County. -First trail work day, with our club members volunteering to help the Over The Hills Gang ATV Club build a puncheon bridge on the Emily-Outing trail. -First full line of Woodtick Wheeler gear for women, introduced at the spring meeting. -Welcomed many new members and Business Sponsors. -Had 9 club rides — including the ATVAM 35th Anniversary Ride in Isle and Fall Ride & Rally in Willow River — and two big meetings, including a pancake breakfast in spring. -Kept members informed on ATV news and issues from across Minnesota. -Certified 20 youth riders at our ATV Safety Class in Walker. -Our DNR volunteer Trail Ambassadors rode over 290 hours, for a total of 1048 miles, monitoring State ATV trails. Our DNR grant to reimburse TA expenses was just over $5,000. Join our team! The DNR has TA courses coming up; get info at DNR website. -Recognized Pam and Dave Shaw as Members of the Year. -Started a project to promote ATV safety within schools county-wide. -Cleaned our stretch of State 200 under the Adopt-A-Highway program. -Visited with many families at National Night Out; and volunteered at the DNR ATV booth at the Minnesota State Fair. -Promoted and thanked our Business Members year-round, and bought many $25 gift cards from them, for use as prizes and thank-you’s to members. -Sold lots of cool club gear to members, and friends of the club near and far! 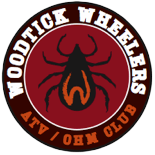 Thanks for supporting the Woodtick Wheelers! Send us your feedback on the club and ideas for future rides and meetings.